1. Soak skewers in water for a few minutes. 2. Thread zucchini, pineapple, shrimp and repeat. 3. Mix marinade ingredients and pour over skewers. 4. Let sit for about 10 minutes turning container upside down a few time to distribute marinade. 5. Heat a pancake griddles or counter top grill to 350 degrees. 6. Spray surface with cooking spray. 7. 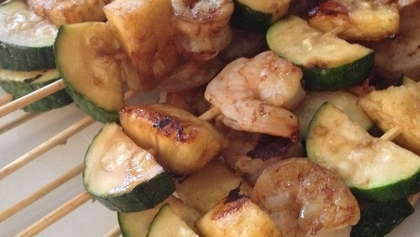 Grill kebabs for approximately 4 minutes per side until shrimp is no longer pink. 8. Meanwhile, boil remaining marinade in small pot for 2-3 minutes. 9. Serve kebabs over rice with extra sauce.